My Illusive Secret, under jockey Jesus Valenzuela, holds off Brindis Cruz (#2) to win the $29,000 Wyoming Bred Futurity on Sunday at Sweetwater. ROCK SPRINGS, WY—SEPTEMBER 9, 2018—In an upset victory by a neck, Jesus Valenzuela rode My Illusive Secret to a win in the $29,000 Wyoming Bred Futurity in Sunday’s feature race at Sweetwater. My Illusive Secret ($22.20) held off late-charging longshot Brindis Cruz and Santiago Jimenez at 22-1. My Illusive Secret was second in her trial and was the sixth fastest qualifier overall from three trials held on August 25. Final time for the 350 yard race was 17.753; the winner earned a speed index of 89. My Illusive Secret was the second horse sired by Brindis Por Cayenne to win a stakes race at Sweetwater on Sunday. The filly is out of stakes-placed mare Secretly Illusive, by Bedunio Secret. She was bred in Wyoming by her owner, Gerald Kaul, and is trained by Jesse Villegas. My Illusive Secret broke her maiden in her debut in Miles City in May. Since then, she has competed in seven races and has never finished off the board. She has won three races and has lifetime earnings of $21,260. This was her first stakes win. Brindis Cruz completed the Brindis Por Cayenne exacta for trainer Jess Matt, attempting to post an even bigger upset. The gelding is owned by Lana Matt and was bred in Wyoming by K. C. Carden. She is out of the Check Him Out mare Gm Check Her Out. Brindis Cruz was second in her trial as the fifth fastest qualifier. She has also never finished out of the money, with two wins in six starts, including a victory in the Big Sky Select Breeders Futurity in Great Falls in July. 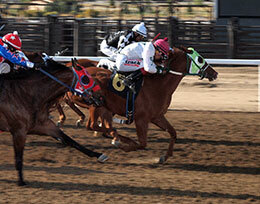 She also placed second in the Energy Downs Wyoming Bred Futurity in June. Flying late from the outside to get third place was Vvr No Refunds and jockey Oscar Cervantes. Vvr No Refunds is trained by Diana Garfas for owner Anais Robles. She was bred in Wyoming by Mike Lipp, by Coronas Velvet and out of the Apollo mare Apollo Storm. Vvr No Refunds had won three consecutive races before Sunday’s futurity, including her trial in which she defeated My Illusive Secret. Completing the field were Fame Creek, A Dash of Dynasty, Switching Creeks, Wave Experte, Jewel Diamond and Chloes Smoke N Fame. Ss Happy Dance was scratched.